Thanks to their long maintenance-free operating life and their wear-free gearing, our helical-bevel gear units are – technically speaking – economical right-angle gear units. Their high level of efficiency, however, makes them real energy savers. 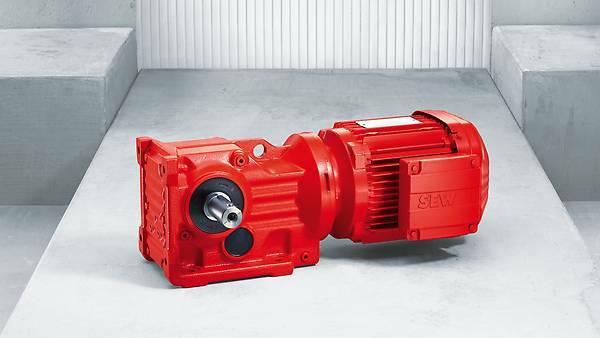 The compact design of all our gear units is most obvious in our helical-bevel gear units. This property is particularly interesting, for example, for machine applications with limited space available. Here, you need powerful drive technology with a compact design. This is just the right environment for our helical-bevel gear units with a torque range from 80 to 50,000 Nm. With their high efficiency in both directions of rotation and at any input speed, these right-angle gear units are very energy-efficient. Their high-endurance gearing is wear-free and lasts a gear unit's lifetime. For precise positioning tasks, you can use the K series gear units with reduced backlash. in our portfolio: sizes K..39 and K..49 complete our range of two-stage helical-bevel gear units. They set the standards together with sizes K..19 and K..29: four sizes allow for torques from 80 Nm to 500 Nm. Only half the solution without a motor? Then use our modular concept and combine the gear units of the K series with an AC motor to a K..DR.. helical-bevel gearmotor, or with a servomotor to a K..CMP helical-bevel servo gearmotor of your choice. Or simply choose the separate AC motor or servomotor that meets your requirements. over the entire service life due to wear-free gearing and a long, maintenance-free operating life. 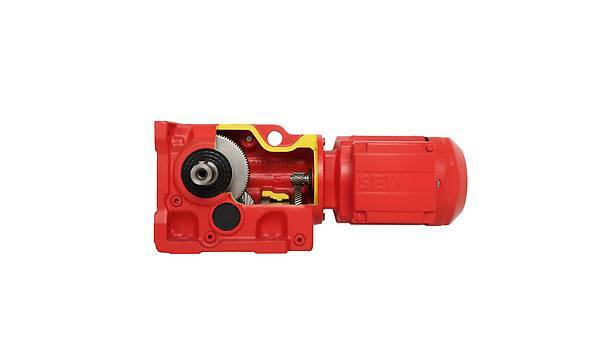 in a compact design offered by 16 sizes with torque ratings between 80 Nm to 50,000 Nm. due to the high efficiency degree in both directions of rotation and at any input speed. are the K..19 and K..29 sizes as their housing is made of aluminum.